Mr. 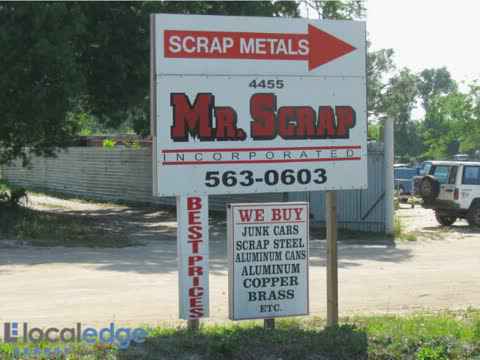 Scrap was established in 1995. Keith runs the business, his wife Sunshine manages the office and his Mom Mama Scrap also works in the office two days a week as his bookkeeper. We pay cash for cars, trucks and all types of scrap metal including aluminum cans, copper, brass, stainless steel, aluminum, wire, lead, electric motors, batteries, heavy equipment, appliances, lawn equipment, metal buildings, steel trailers, cast bath tubs, etc. The facility is fully equipped including a magnet to offload your metal along with a large digital truck scale with a printed scale read out. We welcome demolition crews and contractors. As you drive your own truck on the scale you will notice to your right a digital read out of your weight. It's plainly visible from the driver's side of your vehicle. Here at Mr. Scrap Inc. all of our employees are trained on the different types of metals. We assure you that you get the best prices for your metals. In our facility we have a large inventory of cars and trucks for parts. Mr. Scrap is a you pull it yard so bring your tools. Bring in your scrap metals, bikes, washers, dryers, stoves, refrigerators, hot water heaters, motorcycle and car parts etc. (Anything a magnet sticks to) When entering the yard drive onto the weight scale on the left side of the building to get your weight calculated using our digital scale. Proceed to the back of the yard where the magnet will off load your vehicle while you can conveniently sit and watch. After you've unloaded drive back to the scale and weigh out. Come into the office and we will give you a digital read out with your weight on it along with your cash. A convenient covered drive through on the property to unload your aluminum cans, copper, batteries, electric motors, etc. You will receive an itemized ticket with your weight, price per pound along with the cash paid to you. If you have a mixed load, please keep it separate as they are weighed on separate scales and price per pound may differ. Mr. Scrap Inc. is conveniently located and we meet all E.P.A. standards. We've been a participant of community projects and donations for many years. Our sister location is in Ft Pierce and is called 2nd Chance Auto Salvage, located at 1303 Angle Rd. Phone # 772-461-2222. If you're in the area please feel free to off load your scrap metal here.